Cacao beans are considered a super food that are high in antioxidants, magnesium, iron, fiber and other essential minerals. These small seeds pack a powerful punch when it comes to eating healthy. They are also called Theobroma (meaning food of the gods). No matter what we like to call them the first thing that comes to mind is chocolate. That's because all chocolate is made from this bean. But the highest nutritional value of this super food is obtained in its natural unprocessed state. Processed chocolate contains ingredients that are not in our best interest such as white sugar and added fat. Unfortunately processing these beans depletes much of their wholesome goodness. 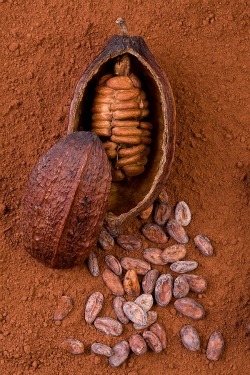 Cacao beans are seeds that come from the fruit pods which grow on the cacao trees. These trees grow in areas which are close to the equator providing them with warmth all year round like parts of Africa, South America, Central America and Indonesia. Once the fruit pod is mature and ready to harvest is has a leathery rind which holds about 35 to 50 large cocoa beans (seeds) in it. At this point the seeds are still soft and light in color. Once removed and the drying process begins they become darker like a reddish brown. In their natural unprocessed state theses beans are truly super foods which offer amazing health benefits. Antioxidants are extremely important because they reduce the everyday cell damage our bodies encounter from the environment we live in. Antioxidants help reduce cell damage which will slow down the aging process, help maintain good health and assist in disease prevention. Things that we consume that contain antioxidants help detoxify the body. Iron is extremely important as its main function helps carry oxygen to all parts of the body. Cacao beans are also said to contain chromium, iron, copper, potassium, manganese, sulfur and zinc which are all required to maintain good health. This sounds as good as taking a mineral supplement? Fiber is important to maintain good digestion and prevent constipation. This helps not only to regulate bowel movements but a strong and healthy digestive tract helps prevent the onset of disease. 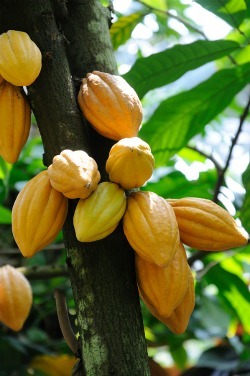 The big buzz about cacao is its ability to improve one’s mood. It is said to increase the levels of certain neurotransmitters in our brains such as serotonin, endorphins, phenylethylamine and anandamide. These chemicals can help improve one’s mood, self esteem, decrease anxiety and may help those with depression. Also Phenylethylamine (PEA) has been known to help us feel more alert and focused in everyday tasks. Scientists say that the body produces more PEA when we experience the feelings of love. Phenylethylamine is also sold as a weight loss supplement to help battle weight gain and obesity. Does the cacao bean contain vitamin C? This has really been a popular question lately that people want clarified. To clear this up the answer is no. The seed itself does not contain any vitamin C.
Recent studies by Navitas Naturals Labs have confirmed that cocoa beans test negative for Vitamin C.
Consume about 2 tablespoons (approximately equals 1 ounce) of the natural cacao beans or nibs. For easy measure fill up a 1 ounce shot glass and enjoy them as a super simple but amazingly healthy snack. In their natural state these beans are a little bitter but you can always spruce things up a bit to suit your taste buds. My personal favorite is eating a small handful of them mixed with sweet dried fruits such as dried apricots, cranberries or goji berries. The combinations give you a sweeter taste sensation. For a healthy breakfast try mixing them in yogurt, cereals, on fresh fruit or in smoothies. Is it a challenge to get your kids eating healthy? Try adding a few sprinkles of it on top of their breakfast cereal, ice-cream or frozen yogurt. Have fun and get creative by using this healthy food daily.